Quality adult colouring books - all the mandalas and colouring pages have a single page to themselves so you can colour without damaging the next picture. For Advent Calendar Colouring Books see Christmas. 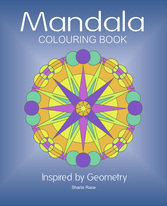 Mandala Colouring Book: Inspired by Geometry. Inspired by geometry the only shapes used in the creation of these Mandalas are circles and straight lines. The circles are shaped and stretched and the lines are combined to create many different shapes and patterns. Some of the Mandalas are quite complex and some are quite simple - you can choose the right one for your mood and the amount of time you have available. Great fun for adults and young people. Intricate, repeating patterns to colour. Each of the patterns has a page to itself so you can colour without damaging the next pattern. Inspired by fun, the patterns are varied and imaginative. Some are quite complex and some a little easier - you can choose the right one for your mood and the amount of time you have available. Great fun and relaxing. ​Paperback: Amazon UK, Amazon US. Each of the 32 Mandalas has a page to itself so you can colour without damaging the next Mandala. Inspired by fun the mandalas are varied and imaginative. Some of the Mandalas are quite complex and some are quite simple - you can choose the right one for your mood and the amount of time you have available. Great fun, and relaxation, for adults and children. A fabulous collection of 32 mandalas for you to colour. The designs have all been inspired by medieval abbey tiles found at the Yorkshire Cistercian abbeys of Rievaulx, Fountains, Meaux, Kirkstall, and Byland. Great fun for all ages. A fabulous collection of 32 mandalas for you to colour. The designs have all been inspired by medieval tiles found at abbeys, priories, churches, and cathedrals throughout the UK. Great fun for all ages. Each of the fifty quality designs in this wonderful book has a page to itself so you can colour without damaging the next design. This beautiful colouring book is suitable for adults and young people. The mandalas and patterns in this colouring book have all been inspired by medieval tiles found in abbeys, priories, churches and cathedrals in the United Kingdom. An inspiring and fun collection of fifty mandalas for you to colour. The designs vary from detailed to big and bold so there will always be a mandala that suits your mood. Hours of fun.